ADA, Mich., April 3, 2017 -- Amway, a global leader in premium nutrition and beauty, today announced the launch of G&H, naturally inspired and thoughtfully made bath and body care for the whole family. Combining the best of nature with Amway’s scientific leadership, G&H body care includes three complementary collections, all featuring naturally inspired ingredients and eco-sensitive packaging. 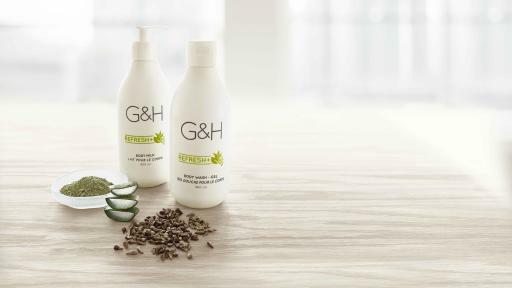 G&H, developed with a holistic approach, draws on key principles to achieve balanced skin while being globally and environmentally mindful. Combining Amway’s skin expertise applied to the Artistry™ brand – one of the top premium skincare brands – with the company’s commitment to R&D and know-how blending botanical extracts with other scientifically advanced ingredients, G&H represents a new level of gentle, safe, effective body care. Restorative body care help nourish, comfort and maintain healthy looking skin with a rich, exclusive blend of naturally derived and botanical ingredients. Each Nourish+ product includes shea butter, organic pumpkin seed oil and orange blossom honey - touting the best overall moisturizing effect of the many widely used varieties of honey. Available products: Body Lotion, Body Wash, Complexion Bar and Hand Cream. Revitalizing body care refreshes, hydrates and soothes skin with lightweight and gentle formulas infused with aloe, grapeseed extract and green tea extract, delivering healthy-looking skin. Available products: Body Milk and Body Wash-Gel. Purifying body care deep cleans to remove impurities, and gently protects skin with exclusive, targeted deodorizing technology and a skin-defending botanical blend of white tea, natural minerals and bilberry extract. Skin feels clean and smells fresh from morning to night. Available products: Concentrated Hand Soap, Bar Soap and Deodorant/Antiperspirant Roll-On. All G&H washes and bar soaps are biodegradable and formulated without sulfates or antibacterial chemicals like triclosan. Every formula is wheat-free, contains no animal ingredients and has been dermatologist and allergy tested to minimize the risk of irritation. From package design, product formulation and manufacturing, G&H is an environmentally sensitive alternative that goes beyond skin deep. G&H products are manufactured using 100% wind power. All bottles and cartons* are 100% recyclable and packaged in innovative bottles designed to use less overall plastic per unit. Amway also delivers eco-efficient refill pouches for multiple products. Amway is an $8.8 billion direct selling business based in Ada, Michigan, USA. Top-selling brands for Amway are Nutrilite™ vitamin, mineral and dietary supplements, Artistry™ skincare and color cosmetics, eSpring™ water treatment systems and XS™ energy drinks – all sold exclusively by Amway Business Owners. Global sales in 2015 made Amway the No. 1 direct selling business in the world, according to the 2016 Direct Selling News Global 100. The company’s annual sales figure includes revenue from direct selling operations and other business holdings. For company news, visit globalnews.amway.com.